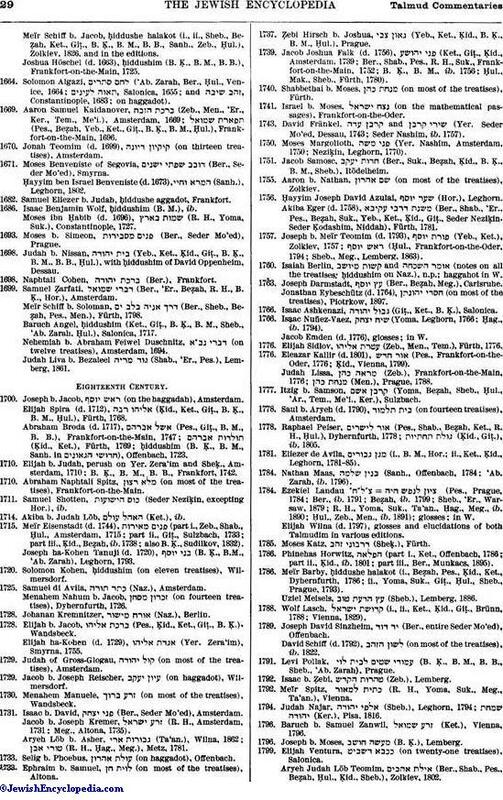 Chronological List of Commentators on Both Talmudim. The commentaries on the Talmud constitute only a small part of halakic literature in comparison with the responsa literature and the commentaries on the codices. At the time when the Talmud was concluded the traditional literature was still so fresh in the memory of scholars that there was no need of writing Talmudic commentaries, nor were such works undertaken in the first period of the gaonate. Palṭoi Gaon (c. 840) was the first who in his responsa offered verbal and textual comments on the Talmud. Ẓemaḥ b. Palṭoi (c. 872) paraphrased and explained the passages which he quoted; and he composed, as an aid to the study of the Talmud, a lexicon which Abraham Zacuto consulted in the fifteenth century. Saadia Gaon is said to have composed commentaries on the Talmud, aside from his Arabic commentaries on the Mishnah (Benjacob, "Oẓar ha-Sefarim," p. 181, No. 430). According to the Karaite Solomon b. Jeroham, a commentary on Yerushalmi by Ephraim b. Jacob existed as early as the time of Saadia, although this is highly improbable (Pinsker, "Liḳḳuṭe Ḳadmoniyyot," Supplement, p. 4; Poznanski, in "Kaufmann Gedenkbuch," p. 182). The last three great geonim, Sherira, Hai, and Samuel b. Ḥofni, did much in this field. Most of Sherira's comments were explanations of difficult terms. Many of these are quoted by Abu al-Walid (Bacher, "Leben und Werke des Abulwalid Merwân ibn Gānāḥ," etc., p. 85). It appears from the quotations in the "'Aruk" that Hai Gaon wrote commentaries on at least eleven treatises (Kohut, "Aruch Completum," xiii. et seq.). Abu al-Walid quotes Hai's commentary on Shabbat (Bacher, l.c. p. 87). In the eleventh century commentaries on the Talmud were composed not only in Babylon but also in Africa, Spain, and Germany. In the first half of that century Nissim b. Jacob, of Kairwan in northern Africa, composed his "Kitab Miftaḥ Maghaliḳ al-Talmud" (Hebr. title, "Sefer Mafteaḥ Man'ule ha-Talmud" = "Key to the Locks of the Talmud"), a commentary in which he explains difficult passages by references to parallel ones and occasionally to Yerushalmi also. The work of Hananeel b. Ḥushiel corresponds more to a commentary in the exact sense of the term. He sums up the Talmudic discussions, perhaps in order to facilitate the halakic decision, devoting his attention principally to determining the correct text of the Talmud. The first teachers in Spain, Enoch ben Moses, Joseph ibn Abitur, Isaac ibn Ghayyat, and Isaac Albargeloni, are also known to have composed commentaries on the Talmud (Weiss, "Dor," iv. 276 et seq.). Naḥmani quotes Talmudic comments from a work by Samuel ha Nagid (Benjacob, l.c. No. 481). According to a not entirely authenticated statement (ib. No. 247), the famous exegete Abraham ibn Ezra composed a commentary on the treatise Ḳiddushin. In Germany, Gershom b. Judah engaged in similar labors, though his commentaries have come to light only in the last century: they appear to have been the chief sources used by Rashi (1040-1105), the greatest commentator of the Talmud. Although Rashi drew upon all his predecessors, yet his originality in using the material offered by them has always been admired. His commentaries, in turn, became the basis of the work of his pupils and successors, who composed a large number of supplementary works that were partly in emendation and partly in explanation of Rashi's, and are known under the title "tosafot." These works were printed together with Rashi's commentaries in the first editions of single Talmud treatises, and then in the collective editions. The tosafot included in the present editions are taken from various collections. There are tosafot of Sens, tosafot of Evreux, tosafot of Touques, etc. (Winter and Wünsche, "Die Jüdische Litteratur," ii. 465). Instead of the simple, strictly logical method of exegesis a dialectic method showing great acumen is frequently employed in the tosafot. 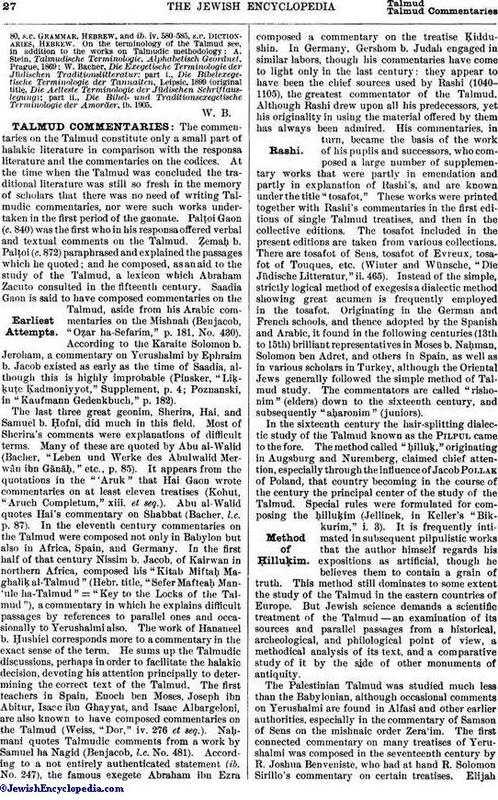 Originating in the German and French schools, and thence adopted by the Spanish and Arabic, it found in the following centuries (13th to 15th) brilliant representatives in Moses b. Naḥman, Solomon ben Adret, and others in Spain, as well as in various scholars in Turkey, although the Oriental Jews generally followed the simple method of Talmud study. The commentators are called "rishonim" (elders) down to the sixteenth century, and subsequently "aḥaronim" (juniors). In the sixteenth century the hair-splitting dialectic study of the Talmud known as the Pilpul came to the fore. The method called "ḥilluḥ," originating in Augsburg and Nuremberg, claimed chief attention, especially through the influence of Jacob Pollak of Poland, that country becoming in the course of the century the principal center of the study of the Talmud. Special rules were formulated for composing the ḥilluḳim (Jellinek, in Keller's "Bikkurim," i. 3). It is frequently intimated in subsequent pilpulistic works that the author himself regards his expositions as artificial, though he believes them to contain a grain of truth. This method still dominates to some extent the study of the Talmud in the eastern countries of Europe. But Jewish science demands a scientific treatment of the Talmud—an examination of its sources and parallel passages from a historical, archeological, and philological point of view, a methodical analysis of its text, and a comparative study of it by the side of other monuments of antiquity. The Palestinian Talmud was studied much less than the Babylonian, although occasional comments on Yerushalmi are found in Alfasi and other earlier authorities, especially in the commentary of Samson of Sens on the mishnaic order Zera'im. The first connected commentary on many treatises of Yerushalmi was composed in the seventeenth century by R. Joshua Benveniste, who had at hand R. Solomon Sirillo's commentary on certain treatises. ElijahFulda commentated in 1710 the order Zera'im and part of the order Neziḳin. The greater part of Yerushalmi was edited about the middle of the eighteenth century by Mendelssohn's teacher David Fränkel; and a complete commentary was written by Moses Margolioth. Noteworthy as commentators in the nineteenth century are Nahum Trebitsch and Zacharias Frankel. The commentaries on Babli may be divided into: (1) "perushim," running commentaries accompanying the text; (2) "tosafot" (additions), glosses on Rashi's commentary; (3) "ḥiddushim" (novellæ), explicit comments on certain passages of the Talmud text; and (4) "haggahot," or marginal glosses. 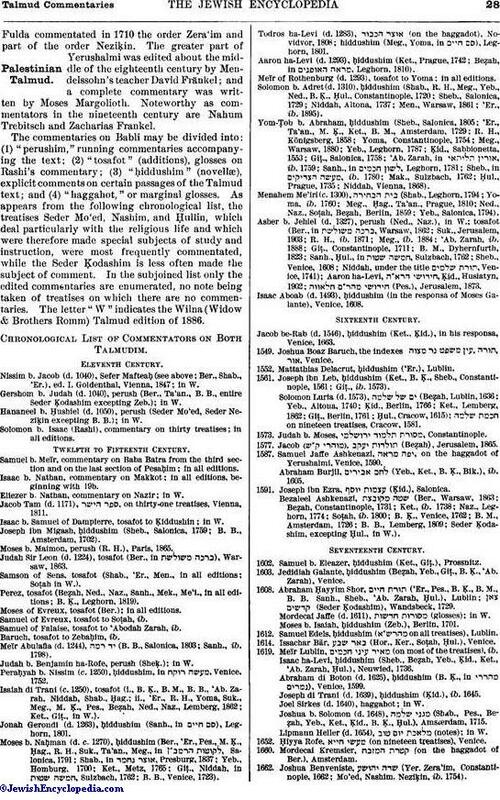 As appears from the following chronological list, the treatises Seder Mo'ed, Nashim, and Ḥullin, which deal particularly with the religious life and which were therefore made special subjects of study and instruction, were most frequently commentated, while the Seder Ḳodashim is less often made the subject of comment. In the subjoined list only the edited commentaries are enumerated, no note being taken of treatises on which there are no commentaries. The letter "W" indicates the Wilna (Widow & Brothers Romm) Talmud edition of 1886. Chronological List of Commentators on Both Talmudim. Eleventh Century. Nissim b. Jacob (d. 1040), Sefer Mafteaḥ (see above; Ber., Shab., 'Er. ), ed. I. Goldenthal, Vienna, 1847; in W.
Gershom b. Judah (d. 1040), perush (Ber., Ta'an., B. B., entire Seder Ḳodashim excepting Zeb. ); in W.
Hananeel b. Ḥushiel (d. 1050), perush (Seder Mo'ed, Seder Neziḳin excepting B. B. ); in W.
Solomon b. Isaac (Rashi), commentary on thirty treatises; in all editions. Samuel b. Meïr, commentary on Baba Batra from the third section and on the last section of Pesaḥim; in all editions. Isaac b. Nathan, commentary on Makkot; in all editions, beginning with 19b. Eliezer b. Nathan, commentary on Nazir; in W.
Jacob Tam (d. 1171), , on thirty-one treatises, Vienna, 1811. Isaac b. Samuel of Dampierre, tosafot to Ḳiddushin; in W.
Joseph ibn Migash, ḥiddushim (Sheb., Salonica, 1759; B. B., Amsterdam, 1702). Moses b. Maimon, perush (R. H.), Paris, 1865. Judah Sir Leon (d. 1224), tosafot (Ber., in ), Warsaw, 1863. Samson of Sens, tosafot (Shab., 'Er., Men., in all editions; Soṭah in W.). Perez, tosafot (Beẓah, Ned., Naz., Sanh., Mek., Me'i., in all editions; B. Ḳ., Leghorn, 1819). Moses of Evreux, tosafot (Ber. ); in all editions. Samuel of Evreux, tosafot to Soṭah, ib. Samuel of Falaise, tosafot to 'Abodah Zarab, ib. Baruch, tosafot to Zebaḥim, ib. Meïr Abulafia (d. 1244), (B. B., Salonica, 1803; Sanh., ib. 1798). Judah b. Benjamin ha-Rofe, perush (Sheḳ. ); in W.
Peraḥyah b. Nissim (c. 1250) ,ḥiddushim, in , Venice, 1752. Isaiah di Trani (c. 1250), tosafot (i., B. Ḳ., B. M., B. B., 'Ab. Zarah, Niddah, Shab., Ḥag. ; ii., 'Er., R. H., Yoma, Suk., Meg., M. Ḳ., Pes., Beẓah, Ned., Naz., Lemberg, 1862; Ket., Giṭ., in W.). Jonah Gerondi (d. 1263), ḥiddushim (Sanh., in ), Leghorn, 1801. Moses b. Naḥman (d. c. 1270), ḥiddushim (Ber., 'Er., Pes., M. ḳ., Ḥag., R. H., Suk., Ta'an., Meg., in , Salonica, 1791; Shab., in , Presburg, 1837; Yeb., Homburg, 1700; Ket., Metz, 1765; Giṭ., Niddah, in , Sulzbach, 1762; B. B., Venice, 1723). Todros ha-Levi (d. 1283), (on the haggadot), Novidvor, 1808; hiddushim (Meg., Yoma, in ), Leghorn, 1801. Aaron ha-Levi (d. 1293), ḥiddushim (Ket., Prague, 1742; Beẓah, in , Leghorn, 1810). Meïr of Rothenburg (d. 1293), tosafot to Yoma; in all editions. Solomon b. Adret (d. 1310), ḥiddushim (Shab., R. H., Meg., Yeb., Ned., B. Ḳ., Ḥul., Constantinople, 1720; Sheb., Salonica, 1729; Niddah, Altona, 1737; Men., Warsaw, 1861; 'Er., ib. 1895). Yom-Ṭob b. Abraham, ḥiddushim (Sheb., Salonica, 1805; 'Er., Ta'an., M. Ḳ., Ket., B. M., Amsterdam, 1729; R. H., Königsberg, 1858; Yoma, Constantinople, 1754; Meg., Warsaw, 1880; Yeb., Leghorn, 1787; Ḳid., Sabbionetta, 1553; Giṭ., Salonica, 1758; 'Ab. Zarah, in , ib. 1759; Sanh., in , Leghorn, 1781; Sheb., in , ib. 1780; Mak., Sulzbach, 1762; Ḥul., Prague, 1735; Niddah, Vienna, 1868). Menahem Me'iri (c. 1300), (Shab., Leghorn, 1794; Yoma, ib. 1760; Meg., Ḥag., Ta'an., Prague, 1810; Ned., Naz., Soṭah, Beẓah, Berlin, 1859; Yeb., Salonica, 1794). Asher b. Jehiel (d. 1327), perush (Ned., Naz. ), in W.; tosafot (Ber., in , Warsaw, 1862; Suk., Jerusalem, 1903; R. H., ib. 1871; Meg., ib. 1884; 'Ab. Zarah, ib. 1888; Giṭ., Constantinople, 1711; B. M., Dyhernfurth, 1823; Sanh., Ḥul., in , Sulzbach, 1762; Sheb., Venice, 1608; Niddah, under the title , Venice, 1741); Aaron ha-Levi, , Ḳid., Husiatyn, 1902; (Pes. ), Jerusalem, 1873. Isaac Aboab (d. 1493), ḥiddushim (in the responsa of Moses Galante), Venice, 1608. Jacob be-Rab (d. 1546), ḥiddushim (Ket., Ḳid. ), in his responsa, Venice, 1663. 1549. Joshua Boaz Baruch, the indexes , , Venice. 1552. Mattathias Delacrut, ḥiddushim ('Er. ), Lublin. 1561. Joseph ibn Leb, ḥiddushim (Ket., B. Ḳ., Sheb., Constantinople, 1561; Giṭ., ib. 1573). Solomon Luria (d. 1573), (Beẓah, Lublin, 1638; Yeb., Altona, 1740; Ḳid., Berlin, 1766; Ket., Lemberg, 1862; Giṭ., Berlin, 1761; Ḥul., Cracow, 1615); on nineteen treatises, Cracow, 1581. 1573. Judah b. Moses, , Constantinople. 1577. Jacob (Beẓah), Jerusalem, 1865. 1587. Samuel Jaffe Ashkenazi, on the haggadot of Yerushalmi, Venice, 1590.Abraham Burjil, (Yeb., Ket., B. Ḳ., Bik. ), ib. 1605. 1591. Joseph ibn Ezra, (Ḳid. ), Salonica. Bezaleel Ashkenazi, (Ber., Warsaw, 1863; Beẓah, Constantinople, 1731; Ket., ib. 1738; Naz., Leghorn, 1774; Soṭah, ib. 1800; B. Ḳ., Venice, 1762; B. M., Amsterdam, 1726; B. B., Lemberg, 1809; Seder Ḳodashim, excepting Ḥul., in W.). 1602. Samuel b. Eleazer, ḥiddushim (Ket., Giṭ. ), Prossnitz. 1603. Jedidiah Galante, ḥiddushim (Beẓah, Yeb., Giṭ., B. Ḳ., 'Ab. Zarah), Venice. 1608. Abraham Ḥayyim Shor, ('Er., Pes., B. Ḳ., B. M., B. B. Sanh., Sheb., 'Ab. Zarah, Ḥul. ), Lublin; (Seder Ḳodashim), Wandsbeck, 1729. Mordecai Jaffe (d. 1611), (glosses); in W. Moses b. Isaiah, ḥiddushim (Zeb. ), Berlin, 1701. 1612. Samuel Edels, ḥiddushim ( on all treatises), Lublin. 1614. Issachar Bär, (Hor., Ker., Soṭah, Ḥul. ), Venice. 1619. Meïr Lublin, (on most of the treatises), ib. Isaac ha-Levi, ḥiddushim (Sheb., Beẓab, Yeb., Ḳid., Ket., 'Ab. Zarah, Ḥul. ), Neuwied, 1736. Abraham di Boton (d. 1625), ḥiddushim (B. Ḳ., in ), Venice, 1599. Joseph di Trani (d. 1639), ḥiddushim (Ḳid. ), ib. 1645. Joel Sirkes (d. 1640), haggahot; in W. Joshua b. Solomon (d. 1648), (Shab., Pes., Beẓah, Yeb., Ket., Ḳid., B. Ḳ., Ḥul. ), Amsterdam, 1715. Lipmann Heller (d. 1654), (notes); in W.
1652. Ḥiyya Rofe, (on nineteen treatises), Venice. 1660. Mordecai Kremsier, (on the haggadot of Ber. ), Amsterdam. 1662. Joshua Benveniste, (Yer. Zera'im, Constantinople, 1662; Mo'ed, Nashim Neziḳin, ib. 1754).Meïr Schiff b. Jacob, ḥiddushe halakot (i., ii., Sheb., Beẓah, Ket., Giṭ., B. Ḳ., B. M., B. B., Sanh., Zeb., Ḥul. ), Zolkiev, 1826, and in the editions.Joshua Höschel (d. 1663), ḥiddushim (B. Ḳ., B. M., B. B. ), Frankfort-on-the-Main, 1725. 1664. Solomon Algazi, ('Ab. Zarah, Ber., Ḥul., Venice, 1664; , Salonica, 1655; and , Constantinople, 1683; on haggadot). 1669. Aaron Samuel Kaidanover, (Zeb., Men., 'Er., Ker., Tem., Me'i. ), Amsterdam, 1669; (Pes., Beẓah, Yeb., Ket., Giṭ., B. Ḳ., B. M., Ḥul. ), Frankfort-on-the-Main, 1696. 1670. Jonah Teomim (d. 1699), (on thirteen treatises), Amsterdam. 1671. Moses Benveniste of Segovia, (Ber., Seder Mo'ed), Smyrna.Ḥayyim ben Israel Benveniste (d. 1673), (Sanh. ), Leghorn, 1802. 1682. Samuel Eliezer b. Judah, ḥiddushe aggadot, Frankfort. 1686. Isaac Benjamin Wolf, ḥiddushim (B. M.), ib.Moses ibn Ḥabib (d. 1696), (R. H., Yoma, Suk. ), Constantinople, 1727. 1693. Moses b. Simeon, (Ber., Seder Mo'ed), Prague. 1698. Judah b. Nissan, (Yeb., Ket., Ḳid., Giṭ., B. Ḳ., B. M., B. B., Ḥul. ), with ḥiddushim of David Oppenheim, Dessau. 1698. Naphtali Cohen, (Ber. ), Frankfort. 1699. Samuel Ẓarfati, (Ber., 'Er., Beẓah, R. H., B. Ḳ., Hor. ), Amsterdam.Meïr Schiff b. Soloman, (Ber., Sheb., Beẓah, Pes., Men. ), Fürth, 1798.Baruch Angel, ḥiddushim (Ket., Giṭ., B. Ḳ., B. M., Sheb., 'Ab. Zarah, Ḥul. ), Salonica, 1717.Nehemiah b. Abraham Feiwel Duschnitz, (on twelve treatises), Amsterdam, 1694.Judah Liva b. Bezaleel (Shab., 'Er., Pes. ), Lemberg, 1861. 1700. Joseph b. Jacob, (on the haggadah), Amsterdam.Elijah Spira (d. 1712), (Ḳid., Ket., Giṭ., B. Ḳ., B. M., Ḥul. ), Fürth, 1768.Abraham Broda (d. 1717), (Pes., Giṭ., B. M., B. B. ), Frankfort-on-the-Main, 1747; (Ḳid., Ket. ), Fürth, 1769; ḥiddushim (B. Ḳ., B. M., Sanh. in ), Offenbach, 1723. 1710. Elijah b. Judah, perush on Yer. Zera'im and Sheḳ., Amsterdam, 1710; B. Ḳ., B. M., B. B., Frankfort, 1742. 1710. Abraham Naphtali Spitz, (on most of the treatises), Frankfort-on-the-Main. 1711. Samuel Shotten, (Seder Neziḳin, excepting Hor. ), ib. 1714. Akiba b. Judah Löb, (Ket. ), ib. 1715. Meïr Eisenstadt (d. 1744), (part i., Zeb., Shab., Ḥul., Amsterdam, 1715; part ii., Giṭ., Sulzbach, 1733; part iii., Ḳid., Beẓah, ib. 1738; also B. Ḳ., Sudilkov, 1832).Joseph ha-Kohen Tanuji (d. 1720), (B. Ḳ., B.M., 'Ab. Zarah), Leghorn, 1793. 1720. Solomon Kohen, ḥiddushim (on eleven treatises), Wilmersdorf. 1725. Samuel di Avila, (Naz. ), Amsterdam. Menahem Nahum b. Jacob, (on fourteen treatises), Dyhernfurth, 1726. 1728. Johanan Kremnitzer, (Naz. ), Berlin. 1728. Elijah b. Jacob, (Pes., Ḳid., Ket., Giṭ., B. Ḳ. ), Wandsbeck.Elijah ha-Kohen (d. 1729), (Yer. Zera'im), Smyrna, 1755. 1729. Judah of Gross-Glogau, (on most of the treatises), Amsterdam. 1729. Jacob b. Joseph Reischer, (on haggadot), Wilmersdorf. 1730. Menahem Manuele, (on most of the treatises), Wandsbeck. 1731. Isaac b. David, (Ber., Seder Mo'ed), Amsterdam.Jacob b. Joseph Kremer, (R. H., Amsterdam, 1731; Meg., Altona, 1735).Aryeh Löb b. Asher, (Ta'an. ), Wilna, 1862; (R. H., Ḥag., Meg. ), Metz, 1781. 1733. Selig b. Phoebus, (on haggadot), Offenbach. 1733. Ephraim b. Samuel, (on most of the treatises), Altona. 1737. Ẓebi Hirsch b. Joshua, (Yeb., Ket., Ḳid., B. Ḳ., B. M., Ḥul. ), Prague. 1739. Jacob Joshua Falk (d. 1756), (Ket., Giṭ., Ḳid., Amsterdam, 1739; Ber., Shab., Pes., R. H., Suk., Frankfort-on-the-Main, 1752; B. Ḳ., B. M., ib. 1756; Ḥul., Mak., Sheb., Fürth, 1780). 1740. Shabbethai b. Moses, (on most of the treatises), Fürth. 1741. Israel b. Moses, (on the mathematical passages), Frankfort-on-the-Oder. 1743. David Fränkel, and (Yer. Seder Mo'ed, Dessau, 1743; Seder Nashim, ib. 1757). 1750. Moses Margolioth, (Yer. Nashim, Amsterdam, 1750; Neziḳin, Leghorn, 1770). 1751. Jacob Samosc, (Ber., Suk., Beẓah, Ḳid., B. Ḳ., B. M., Sheb. ), Rödelheim. 1755. Aaron b. Nathan, (on most of the treatises), Zolkiev. 1756. Ḥayyim Joseph David Azulai, (Hor. ), Leghorn.Akiba Eger (d. 1758), (Ber., Shab., 'Er., Pes., Beẓah, Suk., Yeb., Ket., Ḳid., Giṭ., Seder Neziḳin, Seder Ḳodashim, Niddah), Fürth, 1781. 1757. Joseph b. Meïr Teomim (d. 1793), (Yeb., Ket.). Zolkiev, 1757; (Ḥul., Frankfort-on-the-Oder, 1794; Sheb., Meg., Lemberg, 1863). 1760. Isaiah Berlin, and (notes on all the treatises: ḥiddushim on Naz. ), n.p. ; haggahot in W.
1763. Joseph Darmstadt, (Ber., Beẓah, Meg. ), Carlsruhe.Jonathan Eybeschütz (d. 1764), (on most of the treatises), Piotrkow, 1897. 1766. Isaac Ashkenazi, (Giṭ., Ket., B. Ḳ. ), Salonica. 1766. Isaac Nuñez-Vaez, (Yoma, Leghorn, 1766; Ḥag., ib. 1794).Jacob Emden (d. 1776), glosses; in W.
1776. Elijah Sidlov, (Zeb., Men., Tem. ), Fürth, 1776. 1776. Eleazar Kallir (d. 1801), (Pes., Frankfort-on-the-Oder, 1776; Ḳid., Vienna, 1799).Judah Lissa, (Zeb. ), Frankfort-on-the-Main, 1776; (Men. ), Prague, 1788. 1777. Itzig b. Samson, (Yoma, Beẓah, Sheb., Ḥul., 'Ar., Tem., Me'i., Ker. ), Sulzbach. 1778. Saul b. Aryeh (d. 1790), (on fourteen treatises), Amsterdam. 1778. Raphael Peiser, (Pes., Shab., Beẓah, Ket., R. H., Ḥul. ), Dyhernfurth, 1778; (Ḳid., Giṭ. ), ib. 1805. 1781. Eliezer de Avila, (i., B. M., Hor. ; ii., Ket., Ḳid., Leghorn, 1781-85). 1784. Nathan Maas, (Sanh., Offenbach, 1784; 'Ab. Zarah, ib. 1796). 1784. Ezekiel Landau (Pes., Prague, 1784; Ber., ib. 1791; Beẓah, ib. 1799; Sheb., 'Er., Warsaw, 1879; R. H., Yoma, Suk., Ta'an., Hag., Meg., ib. 1890; Ḥul., Zeb., Men., ib. 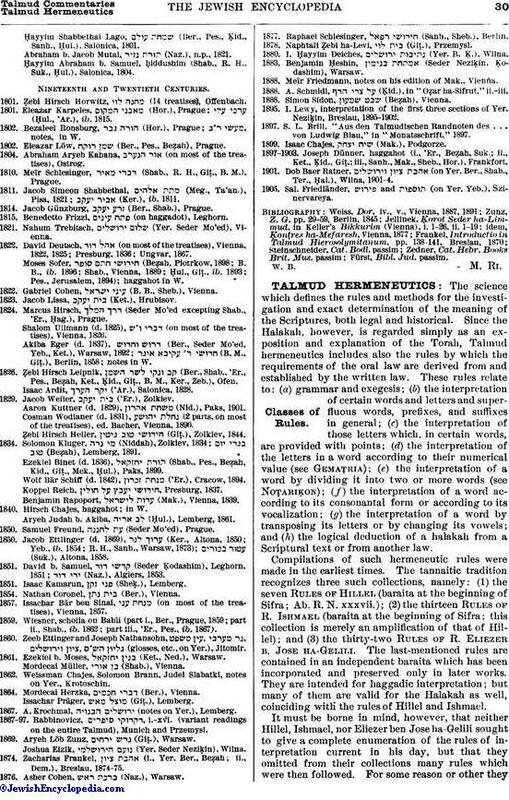 1891); glosses; in W.Elijah Wilna (d. 1797), glosses and elucidations of both Talmudim in various editions. 1785. Moses Katz, (Sheḳ. ), Fürth. 1786. Phinehas Horwitz, (part i., Ket., Offenbach, 1786; part ii., Ḳid., ib. 1801; part iii., Ber., Munkacs, 1895). 1786. Meïr Barby, ḥiddushe halakot (i., Beẓah, Pes., Ḳid., Ket., Dyhernfurth, 1786; ii., Yoma, Suk., Giṭ., Ḥul., Sheb., Prague, 1793).Uziel Meisels, (Sheb. ), Lemberg, 1886. 1788. Wolf Lasch, (i., ii., Ket., Ḳid., Giṭ., Brẓnn, 1788; Vienna, 1829). 1789. Joseph David Sinzheim, (Ber., entire Seder Mo'ed), Offenbach.David Schiff (d. 1792), (on most of the treatises), ib. 1822. 1791. Levi Pollak, (B. Ḳ., B. M., B. B., Sheb., 'Ab. Zarah), Prague. 1792. Isaac b. Ẓebi, (Zeb. ), Lemberg. 1792. Meïr Spitz, (R. H., Yoma, Suk., Meg., Ta'an. ), Vienna. 1794. Judah Najar, (Sheb. ), Leghorn, 1794; (Ker. ), Pisa, 1816. 1796. Baruch b. Samuel Zanwil, (Ket. ), Vienna, 1796. 1796. Joseph b. Moses, (B. Ḳ. ), Lemberg. 1799. Elijah Ventura, (on twenty-one treatises), Salonica.Aryeh Judah Löb Teomim, (Ber., Shab., Pes., Beẓah, Ḥul., Ḳid., Sheb. ), Zolkiev, 1802.Ḥayyim Shabbethai Lago, (Ber., Pes., Ḳid., Sanh., Ḥul. ), Salonica, 1801.Abraham b. Jacob Mutal, (Naz. ), n.p., 1821.Ḥayyim Abraham. b. Samuel, ḥiddushim (Shab., R. H., Suk., Ḥul. ), Salonica, 1804. 1801. Ẓebi Hirsch Horwitz, (14 treatises), Offenbach. 1801. Eleazar Karpeles, (Hor. ), Prague; (Ḥul., 'Ar. ), ib. 1815. 1802. Bezaleel Ronsburg, (Hor. ), Prague; , notes, in W.
1802. Eleazar Löw, (Ber., Pes., Beẓah), Prague. 1804. Abraham Aryeh Kahana, (on most of the treatises), Ostrog. 1810. Meïr Schlesinger, (Shab., R. H., Giṭ., B. M.), Prague. 1811. Jacob Simeon Shabbethai, (Meg., Ta'an. ), Pisa, 1821; (Ker. ), ib. 1811. 1814. Jacob Günzburg, (Ber., Shab. ), Prague. 1815. Benedetto Frizzi, (on haggadot), Leghorn. 1821. Nahum Trebitsch, (Yer. Seder Mo'ed), Vienna. 1822. David Deutsch, (on most of the treatises), Vienna, 1822, 1825; Presburg, 1836; Ungvar, 1867.Moses Sofer, (Beẓah, Piotrkow, 1898; B. B., ib. 1896; Shab., Vienna, 1889; Ḥul., Giṭ., ib. 1893; Pes., Jerusalem, 1894); haggahot in W.
1822. Gabriel Cohen, (B. B., Sheb. ), Vienna. 1823. Jacob Lissa, (Ket. ), Hrubisov. 1824. Marcus Hirsch, (Seder Mo'ed excepting Shab., 'Er., Ḥag. ), Prague.Shalom Ullmann (d. 1825), (on most of the treatises), Vienna, 1826.Akiba Eger (d. 1837), (Ber., Seder Mo'ed, Yeb., Ket. ), Warsaw, 1892; (B. M., Giṭ. ), Berlin, 1858; notes in W.
1826. Ẓebi Hirsch Leipnik, (Ber., Shab., 'Er., Pes., Beẓah, Ket., Ḳid., Giṭ., B. M., Ker., Zeb. ), Ofen.Isaac Ardit, ('Ar. ), Salonica, 1828. 1829. Jacob Weiler, ('Er. ), Zolkiev.Aaron Kuttner (d. 1829), (Nid. ), Paks, 1901.Cosman Wodianer (d. 1831), (2 parts, on most of the treatises), ed. Bacher, Vienna, 1890.Ẓebi Hirsch Heller, (Giṭ. ), Zolkiev, 1844. 1834. Solomon Kluger, (Niddah), Zolkiev 1834; (Beẓah), Lemberg, 1891.Ezekiel Binet (d. 1836), (Shab., Pes., Beẓah, Kid., Giṭ., Mek., Ḥul. ), Paks, 1899.Wolf Bär Schiff (d. 1842), ('Er. ), Cracow, 1894.Koppel Reich, , Presburg, 1837.Benjamin Rapoport, (Mak. ), Vienna, 1839. 1840. Hirsch Chajes, haggahot; in W.Aryeh Judah b. Akiba, (Ḥul. ), Lemberg, 1861. 1850. Samuel Freund, (Seder Mo'ed), Prague. 1850. Jacob Ettlinger (d. 1869), (Ker., Altona, 1850; Yeb., ib. 1854; R. H., Sanh., Warsaw, 1873); (Suk. ), Altona, 1858. 1851. David b. Samuel, (Seder Ḳodashim), Leghorn, 1851; (Naz. ), Algiers, 1853. 1851. Isaac Kamarun, (Sheḳ. ), Lemberg. 1854. Nathan Coronel, (Ber. ), Vienna. 1857. Issachar Bär ben Sinai, (on most of the treatises), Vienna, 1857. 1859. Wiesner, scholia on Babli (part i., Ber., Prague, 1859; part ii., Shab., ib. 1862; part iii., 'Er., Pes., ib. 1867). 1860. Zeeb Ettinger and Joseph Nathansohn, , (glosses, etc., on Yer. ), Jitomir. 1861. Ezekiel b. Moses, (Ket., Ned. ), Warsaw.Mordecai Müller, (Shab. ), Vienna. 1862. Weissman Chajes, Solomon Brann, Judel Slabatki, notes on Yer., Krotoschin. 1864. Mordecai Herzka, (Ber. ), Vienna. Issachar Präger, (Giṭ. ), Lemberg. 1867. A. Krochmal, (notes on Yer. ), Lemberg. 1867-97. Rabbinovicz, , i.-xvi. (variant readings on the entire Talmud), Munich and Przemysl. 1869. Aryeh Löb Zunz, (Giṭ. ), Warsaw. Joshua Eizik, (Yer. Seder Neziḳin), Wilna. 1874. Zacharias Frankel, (i., Yer. Ber., Beẓah; ii., Dem. ), Breslau, 1874-75. 1876. Asher Cohen, (Naz. ), Warsaw. 1877. Raphael Schlesinger, (Sanh., Sheb. ), Berlin. 1878. Naphtali Ẓebi ha-Levi, (Giṭ. ), Przemysl. 1880. I. Ḥayyim Deiches, (Yer. B. Ḳ. ), Wilna. 1883. Benjamin Ḥeshin, (Seder Neziḳin, Ḳodashim), Warsaw. 1888. Meïr Friedmann, notes on his edition of Mak., Vienna. 1888. A. Schmidl, (Ḳid. ), in "Oẓar ha-Sifrut," ii.-iii. 1888. Simon Sidon, (Beẓah), Vienna. 1895. I. Lewy, interpretation of the first three sections of Yer. Neziḳin, Breslau, 1895-1902. 1897. S. L. Brill, "Aus den Talmudischen Randnoten des . . . von Ludwig Blau," in "Monatsschrift," 1897. 1899. Isaac Chajes, (Mak. ), Podgorze. 1897-1903. Joseph Dünner, haggahot (i., 'Er., Beẓah, Suk. ; ii., Ket., Ḳid., Giṭ. ; iii., Sanh., Mak., Sheb., Hor. ), Frankfort. 1901. Dob Baer Ratner, (on Yer. Ber., Shab., Ter., Ḥal. ), Wilna, 1901-4. 1905. Sal. Friedländer, and (on Yer. Yeb. ), Szinervareya.